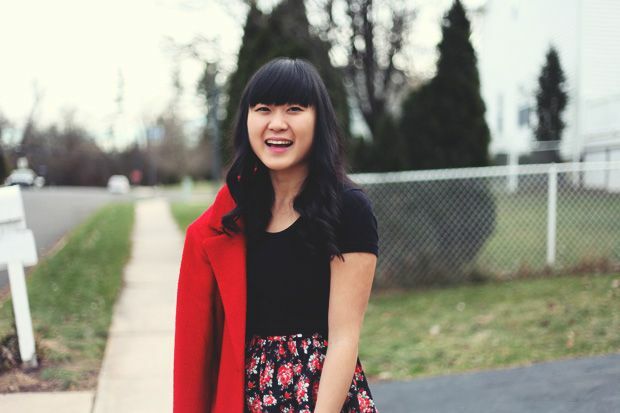 If you guys read my blog back during the summer of 2011, you'll remember when I tried experimenting with straight bangs and it went horribly wrong. Need an example? I'm cringing, but here you go. Now that it's been two years of recovery, this past weekend I decided to give it another try with a more trusted hair salon (thanks to Jeremy's urging). And, well, this is it. If you follow me on Instagram, you already got a sneak peak at what my bangs look like but I figured I should debut them officially on the interwebs. Boom. They're still (literally) growing on me and I go in between loving them and hating them. I guess it just takes some adjusting to but we'll see how long I last before starting to push them to the side. But anyway, just wanted to come on here and wish everyone a very, very Merry Christmas if they're celebrating! If not, enjoy the holidays and the vacation time. I can't wait for the start of a new year and to set off on my Pacific Northwest vacation with Jeremy tomorrow! Sending lots of love and cheer to all of you! Bangs are hard to get used to, I think, though you look lovely in them. You're bangs are banging (har-har) love them on you! It always takes me forever to get used to a new do. They look awesome!! Bangs can be kind of scary at first (I had side bangs for a long time and actually got straight-across ones by accident! But it was the best accident ever!)... and sometimes I've cut mine wayy too short and it's been bad. But I am a firm believer in bangs (though they don't work for everyone)! 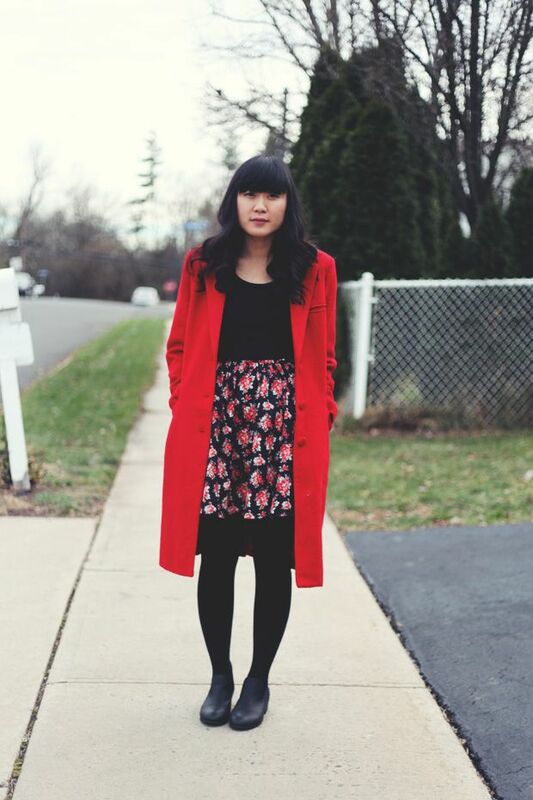 I love this red coat, too. I hope you had a great holiday!! Your bangs look great! Your taste in fashion is excellent as usual. 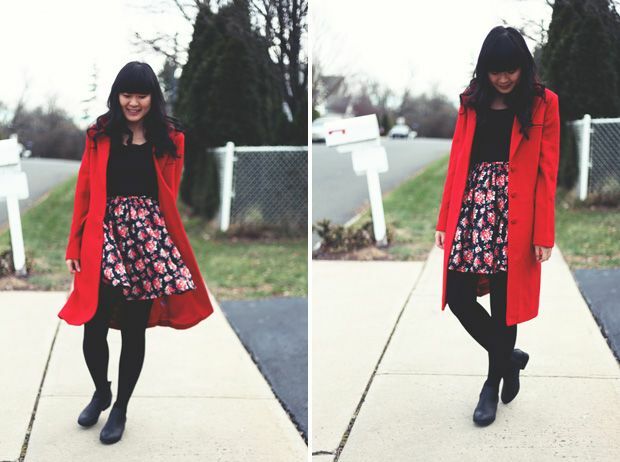 Your American Apparel crop top and Papaya black floral dress look beautiful styled together under that pretty red coat. You have a wonderful talent for showcasing pretty dresses and skirts. You, your bangs and your outfit look fabulous. I love your bangs!! You look really great with bangs! 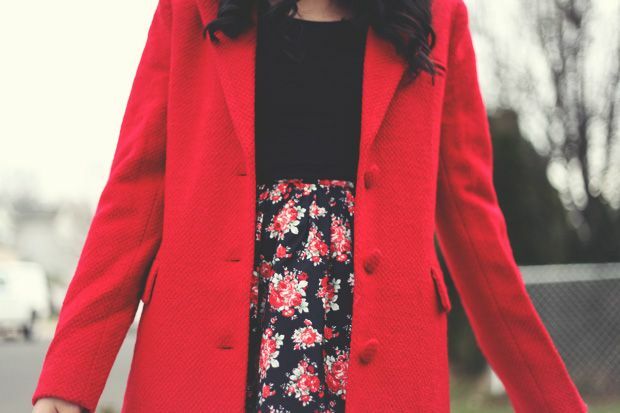 Also, loving your bright red coat! the bangs look great! I've had side swept bangs my whole life and have always wanted to try something different. cutie!! :D happy holidays, jen!